Back in January, I shared a recipe for ginger-almond biscuits that I had created for the “Reading and Refreshments” feature on my siblings’ and my website. Developing the recipe was very exciting for me, since the book we were spotlighting was my own novel. It was such fun to recreate a food that I had written about—certainly without any thought of ever making it myself! Although I do a recipe for “Reading and Refreshments,” every month (my siblings allow me this privilege, as cooking is my area of expertise), I don’t often allow them to cross over to this blog—I’d rather make new ones. But having said that, I simply must tell you about the recipe that I made for last month’s feature. We were highlighting my sister’s novel this time, and she went into great detail (like any proper novelist would) about exactly what she wanted. The story is about a princess who, tired of royal restrictions, is given a year to travel about the country in disguise, to find out if there is some other way of life that she would prefer. She is accompanied on the journey by her occasionally domineering cousin Pete; and along the way, a young gypsy maiden and a mysterious knight join their little band. So, do you have the picture? Medieval travelers roaming the countryside on horseback, searching for adventure, braving dangers, escaping from bandits, etc. What would they have been eating? Well, at one point in the story, they have pancakes. (I can’t go into more detail than that, because it would spoil one of the funniest parts of the book.) But obviously these pancakes would have been very different from the ones we usually eat today. In the first place, travelers would not have been carrying eggs, milk or butter with them; so all those ingredients were out. I used yogurt and oil instead, which have slightly better keeping qualities. For flour, my sister wanted a blend of spelt, the wheat most commonly used in Europe during the medieval period, and almond meal. 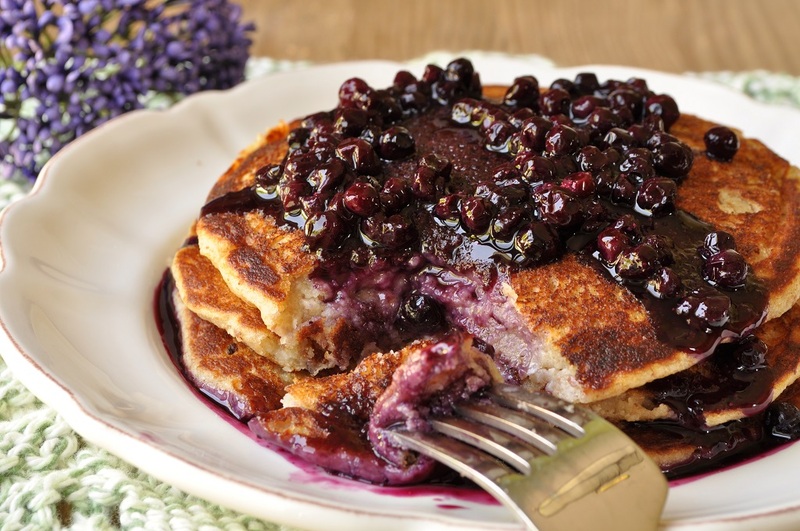 The pancakes were to be served with a wild berry sauce, as the foursome go berry-picking in the wilds during one of the most significant scenes in the book. The only “wild” berries I could get my hands on were frozen wild blueberries, which are, I am aware, completely inauthentic, since blueberries are an American fruit and would not yet have been introduced to Europe at the time of the novel’s setting. However, I had to make do with what I could find. I don’t know exactly what kind of berries would have been growing wild in Central Europe during the Middle Ages; if you do, I should love to hear your suggestions. They also would have used something other than cornstarch as a thickener for their sauce (or, even more likely, nothing at all—I suspect they weren’t as picky about those kinds of things back then.) Still, on the whole, I thought it was a very good effort at replicating the circumstances of the novel, and was very interested to see how it would turn out. 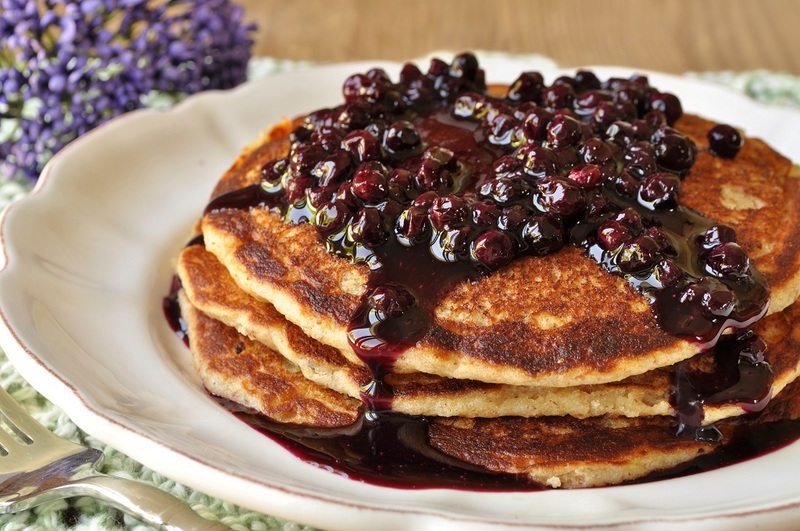 And these pancakes are really quite delightful, so rich and velvety, and the tart berry sauce contrasts wonderfully with their earthy, nutty flavor. I will definitely make them again—even though I am a modern cook who has a refrigerator to keep her eggs and milk fresh and maple syrup to serve on them. I am sharing this recipe with the Cook, Blog, Share linky run by Lucy of Supergolden Bakes, an absolutely gorgeous blog that I have just discovered. Go over and take a look! Her recipes and photography are stunning. I am also linking up with the #FamilyFoodies Pancake Party hosted by Vanesther of Bangers and Mash and Louisa of Eat Your Veg. Another egg-free recipe, and also suitable for those who are avoiding wheat but can still tolerate spelt. In a large bowl, combine the flour, almond meal, baking powder, and salt. Add the yogurt, oil, and honey and stir just until the batter is smooth. Set aside to rest for 15 minutes or so. While the batter is resting, preheat an oiled griddle to 325°F and prepare the sauce. Combine the blueberries, honey, and 2 tablespoons of the water in a small saucepan and bring to a boil. Dissolve the cornstarch in the remaining tablespoon of water and whisk the mixture into the boiling sauce. Continue to boil, stirring occasionally, until thickened, 2-3 minutes. Stir in the cinnamon and pour the sauce into a serving pitcher. Scoop ½-cup portions of the batter onto the preheated griddle and bake until the cakes are well-browned, 5-8 minutes per side. Be careful when flipping them, as they are a bit more delicate than ordinary pancakes, due to the lack of egg and lower amount of gluten. 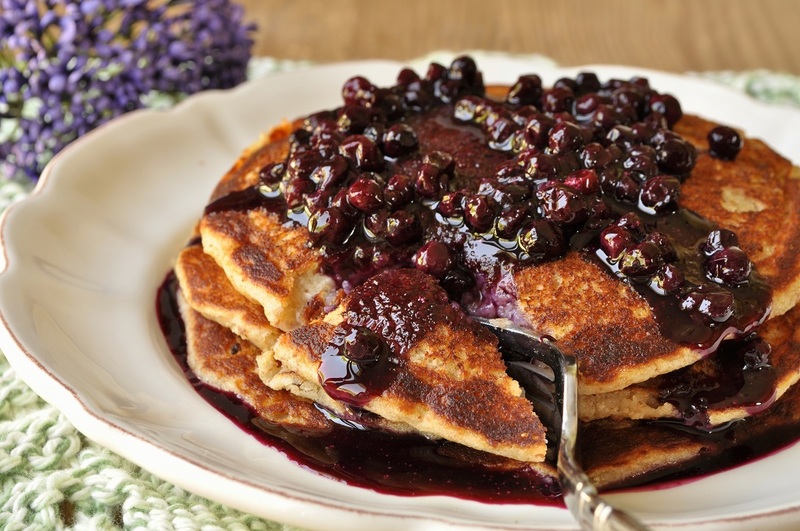 Transfer pancakes to plates and serve with the berry sauce. Thank you, Lucy. I think your photography is gorgeous. I was surprised by how well these photos turned out–I took them in a mad dash on a morning when I had an early appointment and had to get out of the house. And yet I like them better than many photos that I spent an afternoon styling and shooting! Oh, the perversity of it all . . . sigh. Wow, these pancakes look amazing. 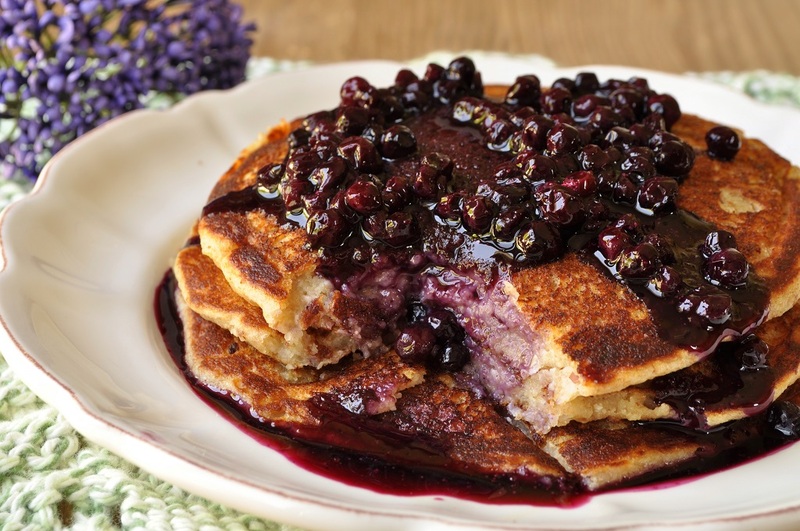 I’m interested in trying out spelt flour so this recipe is very appealing, I especially like the blueberry sauce. Oh, definitely give spelt a try. 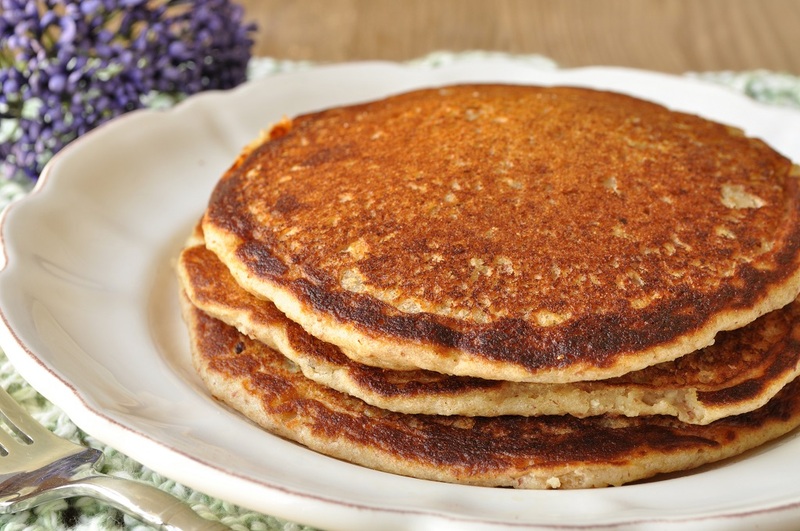 You’ll never want to use regular wheat flour again! 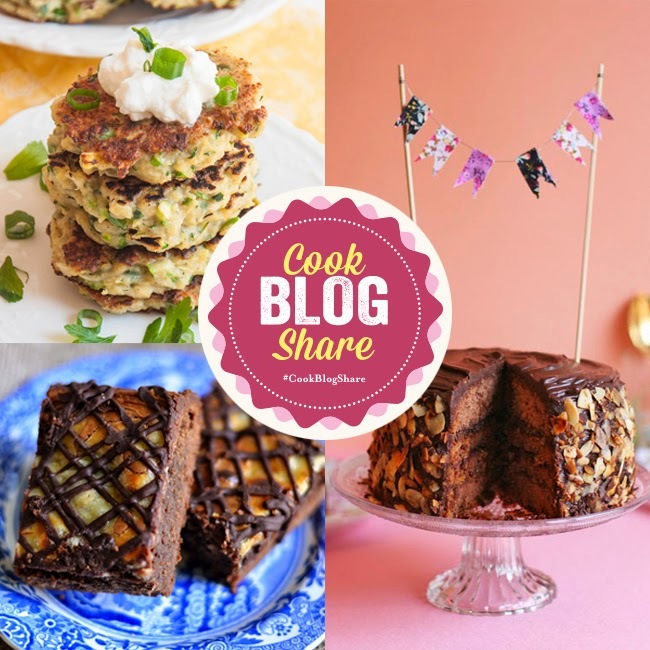 Hi Alexandra – am featuring your pancakes on #CookBlogShare roundup – cant seem to find you on Twitter? Thank you, Lucy! My Twitter account is @lassintheapron. Absolutely love your ‘medieval’ pancakes and could eat quite a pile of these, I’m sure! Thanks so much for linking up with the Family Foodies pancake party!